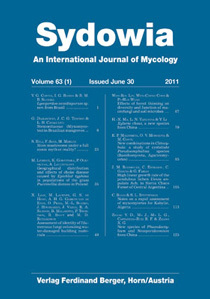 Rojas C. & Stephenson S. L. (2010) Notes on a rapid assessment of myxomycetes for Kabylie, Algeria. Studies of myxomycetes in some regions of the world are limited. Northern Africa is one prominent example. For this reason, a rapid assessment of myxomycete diversity in four study areas within the Kabylie region of Algeria was carried out in July 2008. Fourteen different species were identified from specimens obtained in moist chamber cultures prepared with samples of dead plant material. Six of the species are taxa not previously reported for Algeria. Our preliminary data suggest that myxomycete assemblages in the region may show the influence of topographic and microclimatic factors.